I haven't been blogging much recently: as all my energy's gone to spending time with some very special visitors then recovering from their visits! Firstly, my brother and his family came over from Scotland. I hadn't seen Keith for three years, and I hadn't seen Carolyn or their children for 6 1/2 years! On one of their first days here, Martin and I joined them for a swim. Here the adults are resting on the beach, with the kids still enjoying the water. Aidan and Megan got me started with learning to marble paper. Christmas Day at my parents' place. We've had that Christmas tree almost as long as I can remember! This year it had a theological theme, decorated with lights (symbolising Jesus as the light of the world), chains (the chains of sin that Jesus broke for us) and fruit (the good things Jesus brings). A day or two after Christmas, we returned home. The 'Hope Bears' Martin's Aunty Elspeth made us a few years back hanging in our bedroom. Our dressing table, decorated for Christmas with an advent wreath and Christmas tree. My mum's birthday is just after Christmas. She came to celebrate at our place, along with my brother and his family. Aidan made her these super-cool felted flowers. He showed me a bit of how he does it and, while I really like the effects he can create, I think it would be too physical for me to take up. Martin met pi-Nok and Nut at the airport and had a snack with them before they headed up to Whangarei to his parents house. A few days later, they came to stay with us in Auckland, along with Martin's parents. One day Martin's cousin, Andy, came to visit. 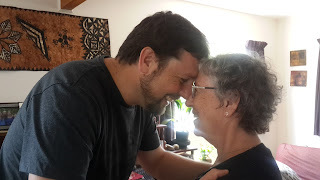 Here he is getting Mum to help him demonstrate one aspect of Kiwi culture. pi-Nok was interested in our door-mat, which is made from strips of old T-shirts braided together. She wants to make one for herself sometime, so I had a go at showing her how to do it. I came to really love pi-Nok. I'm so pleased to have met her at last!